I first want to preface this by saying that I am by no means an expert when it comes to essential oils! There are a lot of more qualified and experienced people out there who know much more than I do, but I still wanted to share my experience using essential oils with you all! Since the start of the new year, I have slowly started incorporating essential oils into my day to day life. Essential oils first became familiar to me about a year or two ago, and to be honest I was a bit of a skeptic. I didn't know what all the hype was about, or why people kept talking about them, but I kept seeing them pop up here and there and quickly became curious. 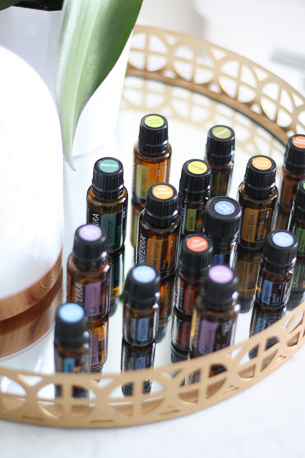 The more I read and heard about essential oils, the more curious I became, and I knew I had to give them a try for myself. That's the only way to know for sure, right? I was so excited when I got my first diffuser as a Christmas gift & ever since then I've been hooked! My oils collection started off small, but over the past few months both my mom & I have added quite a few new oils to the mix. 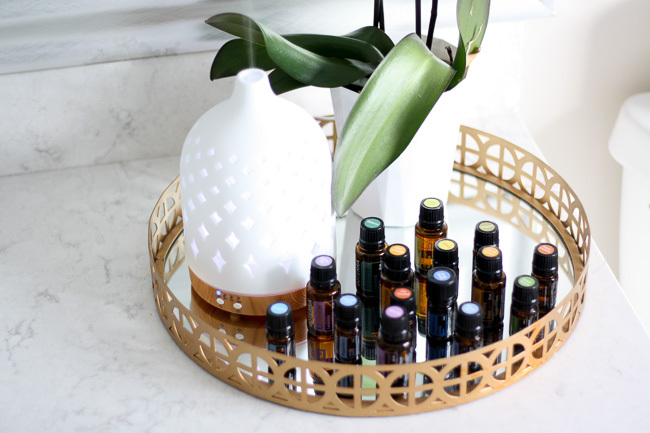 I primarily diffuse my oils to reap the aromatherapy benefits and it is truly amazing the power different scents have on our mood and entire outlook! 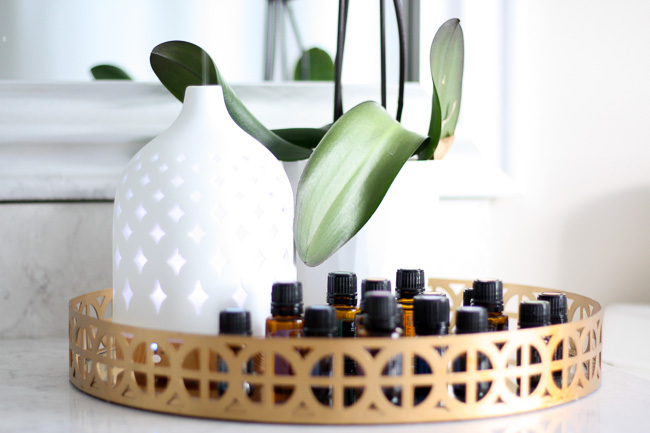 I know aromatherapy is just one of the many benefits these oils provide, and I am excited to continue to learn about all the other things these oils can do. With use not only aromatically, but also topically and internally, the benefits seem endless. 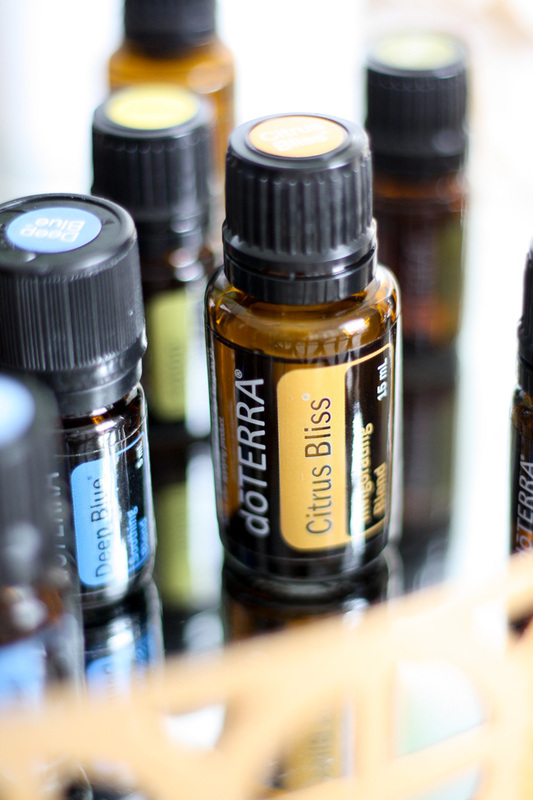 I often now find myself reaching for my oils for aches, pains, and minor ailments! 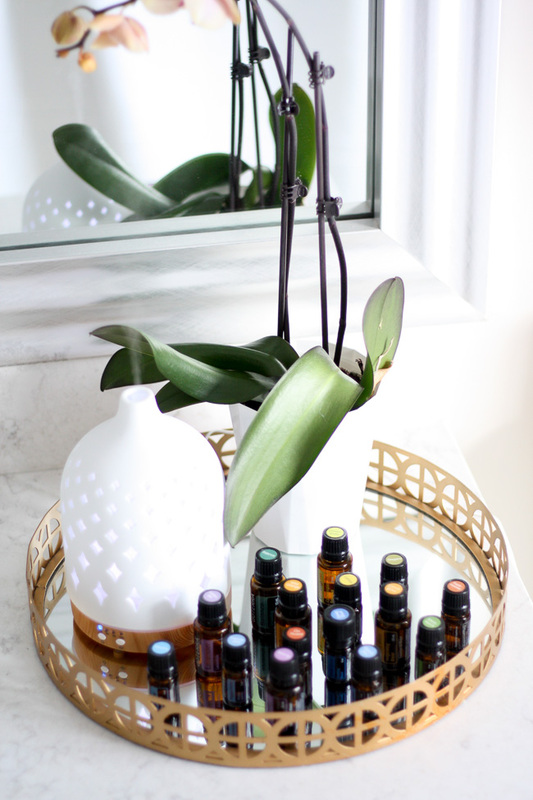 Again, I am no expert in the field of essential oils & am still learning as I go, but I thought I would share how I am using my oils and which ones I use daily. I am all for promoting wellness in both mind and body, and by adding essential oils into my day to day life I feel like I am doing just that. I hope to share the goodness with you too - enjoy! Lavender - Lavender was my first essential oil & I think the one that comes to mind first when people think of oils. It goes without saying that lavender has relaxing and calming properties, and it is my go-to to diffuse when I am sleeping. I love pairing it with peppermint & also the balance blend. Serenity - Similar to Lavender, the Serenity blend is an oil I diffuse at night when I'm sleeping. It's also the perfect oil to help promote feelings of relaxation and help unwind. 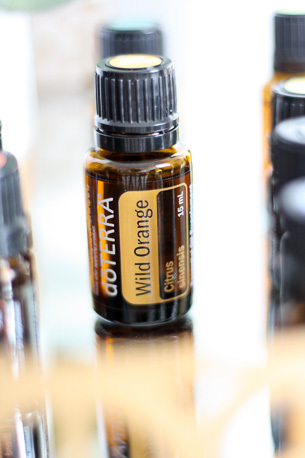 Wild Orange & Citrus Bliss - I love love love diffusing wild orange while I am working during the day. It is so uplifting & motivating, and quite honestly puts me in such a happy mood. Citrus bliss is a blend with similar effects, and is an oil I am coming to use (& love!) quite a lot. Lemon - Lemon is such a clean & crisp scent so it makes for the perfect oil to diffuse for purification, and is also great for cleaning. Plus, a drop can be added to water or tea for enhanced flavor and internal use! Peppermint - Peppermint was an oil that pleasantly surprised me. 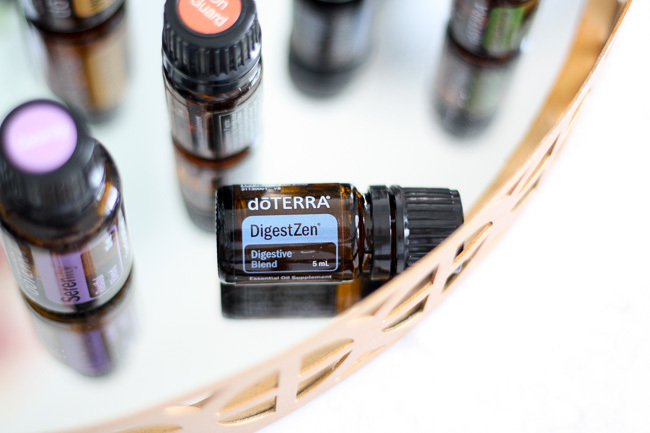 I initially was excited for it as I had heard it was helpful for upset stomachs & nausea, but I have since discovered it's many other benefits. While it is soothing for an uneasy stomach, it is also wonderful when topically applied with lavender on the temples or neck to help relieve stress and reduce tension. When applied topically it has a tingling sensation that is soothing on sore muscles! Breathe - If I had to choose, I think this would be my favorite oil blend! It is amazing - trust me. 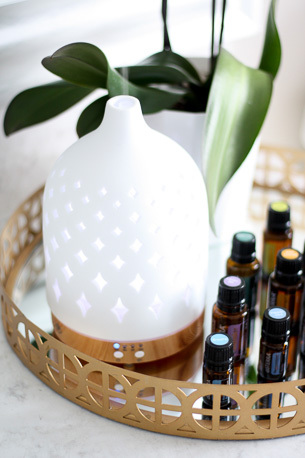 I love diffusing it at night but it is also perfect applied topically right on the chest, especially when feeling a little stuffy or under the weather. Deep Blue - Ah, another one of my favs! I honestly don't know what I did before this oil. I think this was one of the first oils I ever used - a friend gave my mom & I the Deep Blue Rub and we were instantly hooked. It is the best on sore muscles and the perfect way to relax after a good workout. Do you use essential oils? I'd love to hear your experience if you do! 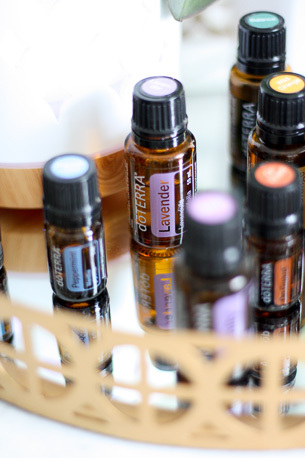 Lovely pictures and story about essential oils. I was a bit of a skeptic at first as well but now love my essential oils! I don't think they are a cure all (that's my nurse scientific brain) but they absolutely enhance my mood and help with many ailments (sore muscles, colds, digestive upset) and so from my nurse holistic brain definitely recommend people try them!